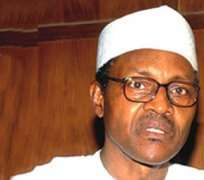 Nigeria's President-elect, Gen. Muhammadu Buhari on Wednesday declared that his administration would not witch-hunt anybody because he was aware that government is a continuum. Buhari said this while inaugurating the 19-member transition committee led by Ahmed Joda in Abuja, with a charge to members not to engage in a witch hunt or fault finding. 'This assignment though onerous, it is well within your ability to accomplish, you are required to assess the information provided to you and advise me on its quality and accuracy. 'It is a simple matter but you must have the right information if you are to shape appropriate policy decisions. Needless to repeat; that your committee and our government are not to witch-hunt or engage in fault finding. 'We want the facts and nothing but the facts, what has been done cannot be undone, our job is to learn from the mistakes of the past in an attempt to avoid similar errors. 'The time given for you to complete your assignment, two weeks, is short but because of the postponement of the election for six weeks from February 14 to March 28, the transition period has been truncated, we are obliged therefore to fast track steps to May 29,' he stated. Earlier, the Chairman of the Committee, Mallam Ahmed Joda who spoke on behalf of other members expressed appreciation to the President elect for considering them to be worthy to help prepare the ground for the incoming administration to take over smoothly on May 29, 2015. 'We as a committee are determined to do the best we can within the time that is allowed to accomplish your wishes and to make it possible for you to achieve your vision and all that you wish for our country. 'When I met you and you briefed me about this assignment, about the composition of the committee, I did observe that I've never served on a committee so weighty like this. 'I have people who are distinguished in their professions, who have their own enterprises and have their own businesses to look after and even serving governors and people in active service to the service of your incoming government and to the service of our motherland. 'He explained to the gathering that members of the committee met for the first time on Wednesday to get to meet and know one another and plan the committee's schedule of activities over the next two weeks. 'I promise you that we'll do our best because we are not only serving you, we are serving our people. We are going to try to begin to lay the foundation for a strong country where justice and peace prevail,' he said. The chairman expressed the opinion that Nigerians entrusted general Buhari with the task of healing their wounds and wiping away their tears and leading our nation to greatness because of the confidence they have in his ability. Joda also said, 'I pledge every one of us will give you the best and most earnest advice from the bottom of our hearts in order that our country, together in peace and unity can realize our goals and aspirations. Members of the committee are: Ahmed Joda, Dr. Doyin Salami, Adamu Adamu,Wale Edun, Mrs. Bola Adesola, Dr. Festus Odumegu and Mrs. Nike Aboderin and the national chairman of the All Progressives Congress, Chief John Oyegun. Others are: Rivers State Governor, Rotimi Amaechi, Chief Audu Ogbeh, Boss Mustapha, Sen. Hadi Sirika, Dr. Ogbonaya Onu, Alh. Abubakar Malami, Gen. Lawal Jafar Isa, Mohammed Hayatudeen, Solomon Dalong, Prof. Tam David West and the national publicity secretary of the All Progressives Congress, Alhaji Lai Mohammed.